Nudged into action by the launch of the Sustainable Restaurant Association, Londonist embarks on an eco eating crawl. 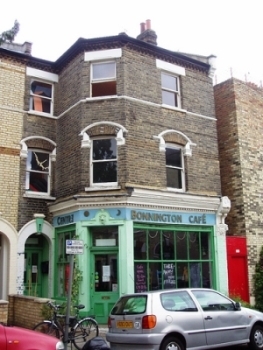 The bohemian Bonnington Cafe started life as an Eighties squat and is now run as a co-operative, sitting prettily in the leafy surroundings of Bonnington Square in Vauxhall. Run by member cooks, with no single person in charge, it obviously aims to operate sustainably, while the decision to exclude fish and meat makes it a good choice for the eco conscious eater. Dinner at the Bonnington Cafe isn't simply a matter of turning up. First you have to contact the chef and see if they will have you. Different people cook every night, each with their own specialities and eccentricities. We wanted to dine on a Saturday night which meant we were to be cooked for and served by Margarete. We sent her an email, swiftly followed by a text (in an over keen moment), and our minor bombardment concluded happily with an 8pm table reservation. We ended up arriving a little early, still over keen, which was, Margarete assured us in a rather stern voice, better than being late. It's BYO - the communal corkscrews hang near the piano - so we cracked our bottle open and settled down to look over the short menu that offered two starters (£3), two mains (£7) and two cakes (£3), all suitably healthy sounding, except perhaps the cake. We chose chickpea tagine with two salads, followed by coffee and cake. The stew arrived fast and was piled high. It was hearty vegetarian fare, all brown rice, quinoa, pulses and leaves. It was good, fresh and homemade, which made the distinctly unglamorous presentation forgivable, but it definitely didn't look or taste gourmet. The coffee and cake that followed was alright, nothing special. The food wasn't amazing the night we visited but it was wholesome and incredibly cheap, and actually we fell a little bit in love with this place as it danced with shadows in the candlelight. It has a lovely atmosphere and interesting history. We'll definitely return, to try out different chefs' cooking and see how it changes with the seasons. Summer must be wonderful when the gardens are at their best, while in winter there's the promise of a roaring open fire.